Discover the MOST EFFECTIVE METHOD of learning the Divi Builder with this revolutionary, hands-on approach. The Divi Demo Zone is 100% free, this means you can improve your skills without spending a single penny! Peek inside the sections, rows and modules of each demo to learn how each layout is achieved, thus making you a Divi Master. Save time & increase profits. Each Demo Zone Layout is also available as a Library Pack to members of our All Access Pass. Load up the Divi Library full of these bad boys and beef up your design arsenal! The Demo Zone is always open and at your disposal, should you decide to have an all night learning session. Jump into the Demo Zone whenever the dreaded “Designer’s Block” hits and freshen up your brain with new ideas and tactics. The Divi Demo Zone will help you gain a better understanding of when CSS should be used and where it should be placed. Divi Zone is hands-down the best way to increase your skills with minimal effort and time. You can learn new techniques to be applied immediately. Learn Divi and start building websites today! With any tool, platform, framework or piece of software, there’s bound to be a learning curve. Divi is no different: you can choose to either play around, test and explore in your own time, or, if you’d like to begin using this revolutionary WordPress framework as a profitable web solution from the get-go, you can bypass the learning curve and become a master Divi developer in no time! Better than any Divi tutorial! By offering you an insider’s view into a collection of Divi page layouts, you’ll be able to learn exactly how to achieve a desired aesthetic with the Divi Builder. By inspecting each of the Content, Design and Advanced tabs of each individual Section, Row and Module, you’ll learn how to set up and style an entire web page in rapid speed. Blog posts and videos are great learning resources, by offering such a hands-on approach, the Divi Demo Zone is by far the best Divi theme tutorial around, and too, is the best way to learn how to build a Divi website. New layouts added each month! To help you keep learning and growing your web development skills, we’ll keep adding new Divi layouts to the Divi Demo Zone each month! 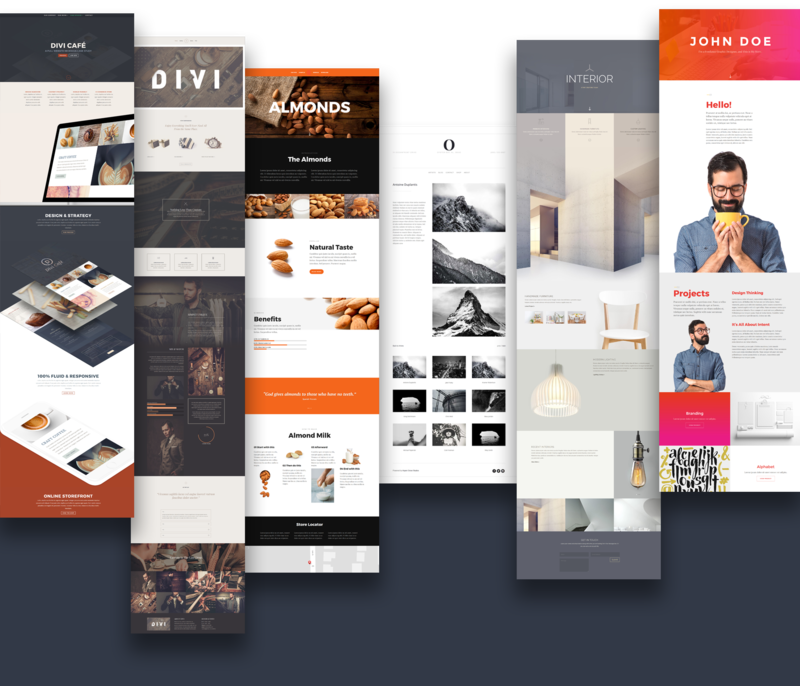 Beautifully crafted to include the latest in web design trends, each new layout will offer you more and more insight and experience as you refine the art of building a website with Divi. As the best place to learn Divi, the Divi Demo Zone will help you to keep innovating as you develop your web development practices. Discover all the Demo Zone layouts and begin improving your Divi Builder skills now. What are people saying about the Demo Zone? Here are testimonials from real life members of the Divi Demo Zone, who have already benefited and honed their skills by peeking behind the scenes of beautifully designed layouts. I just wanted to thank you for the Divi template information. I’ve been in the software support industry for 18 years and I am branching into web design with WordPress. I’ve been playing around with Divi for a month and the olive branch you have set out…where we can review and learn is inspiring me to believe that I really can see my vision through. Thank you so much for the hard work you put into creating the templates you worked on. They are the bomb-diggity!! What a wonderful resource! Thank you so much for taking the time and effort to put this together for the benefit of the Divi user community. I’m often daunted by the prospect of trying to figure out how a stunning page has been put together, so I’m looking forward to diving in with this tool and being able to work out how a particular look has been achieved. Thanks again!! Thanks for making the Divi Demo Zone! Thanks for making the Divi Demo Zone. I think Divi is a great theme and a great builder, but the documentation is sparse, just the minimal basics and not everything is covered. I have read, watched videos, searched and not learned too much. But when i found the Divi Demo Zone and recreated A TRIP AROUND THE WORLD Divi Demo, I learned more than anywhere else. Suitable for Divi users of all skill levels! Regardless if you’re a new Divi user or a seasoned web developer, there’s bound to be a secret hiding in the Divi Demo Zone for you! Whether you’re an expert Divi user that’s looking for a bit of inspiration for an upcoming build, or whether you’ve just discovered Divi and are a bit confused by where you should start, the Divi Demo Zone is bound to give you a handy tip, trick, hint or Aha! moment. All Access members get added benefits! While the Divi Demo Zone is free to use – and will remain free, forever – All Access members are able to enjoy a series of added benefits, such as being able to download each Divi page layout in the Demo Zone. Thanks to Divi’s revolutionary portability features, these JSON layouts can quickly be imported into the Divi Library for use in a web development project. Each layout can be used and reused on unlimited sites, thus, saving you plenty of time in development. Become a member today! Click on the green button below. You will automatically be redirected to the Demo Zone store listing. Add the Demo Zone to your cart. Once you have added the Demo Zone to your cart, click the Checkout button to complete the order process. You’ll receive an email with instructions detailing how to access the Demo Zone. Explore the Divi Demo Zone! From the main Divi Demo Zone page, select the layout you would like to view and start learning! Learn to build amazing websites with Divi today! Don’t waste any time! Learn how to build beautiful, powerful and high-converting websites with Divi today!